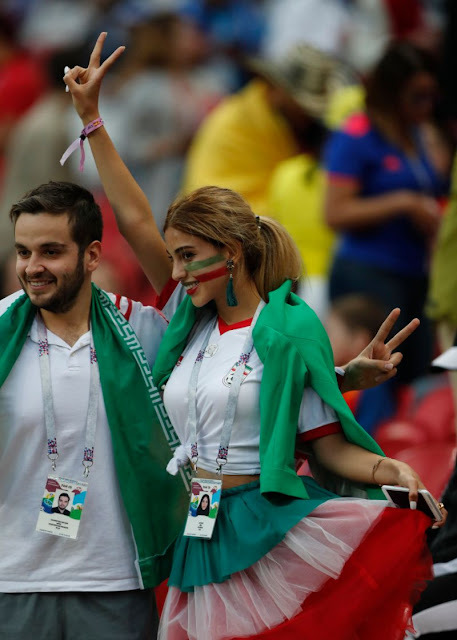 A seemingly ordinary photo of a fan at the World Cup is going viral — and a closer look at the image shows exactly why. A Reddit user uploaded a photo taken at the World Cup this week by AP photographer Frank Augstein. The AP caption, which can be found on Shutterstock, is pretty straightforward, identifying the people in the photo as fans awaiting a match between Spain and Iran in Russia. But the eagle-eyed Reddit user, along with plenty of others, saw a key detail about the woman in the photo. In the ID the woman is wearing, she’s sporting a hijab — but in the photo taken at the match, the head covering is nowhere to be found. This year’s World Cup is a significant one for Iranian women too. Women had been prohibited from watching men’s sporting events since a de facto ban was imposed following 1979’s Islamic revolution, the Huffington Post says. There’s no official legal ban, but women have been arrested for attending men’s sporting events in Iran in the past. On Wednesday, though, women joined the crowds at the Azadi Stadium in Tehran to watch a live broadcast of the Iran-Spain match. Granted, it was not a live sporting event being held in their country, but it’s a start. Other fans, like the woman in the now-viral photo, traveled to Russia for the World Cup. By viewing the World Cup events in Kazan, Iranian women had the chance to cheer on their country’s team, live from the stands. Some women also brought signs with them to the World Cup, advocating for a change in Iran’s policy. “Support Iranian women to attend stadiums,” one World Cup sign read. The woman in the image hasn’t been identified, and it’s not clear why she might have gone without the hijab from the ID photo. One Reddit commenter speculated that it may be because if the photo was taken in Iran, she could have been required to wear it. The commenter added that some women don’t wear hijabs when traveling outside Iran. That could be because hijabs may be required in their country because of rules and not necessarily because of religious beliefs, the commenter explained. Whatever the circumstances are surrounding the woman in this particular photo, it looks like she’s having a great time cheering on her team.